In analogy to the amplification of light in a laser, vibrations of a semiconductor crystal, so-called phonons, were enhanced by interaction with an electron current. Excitation of a metal-semiconductor nanostructure by intense terahertz (THz) pulses results in a 10-fold amplification of longitudinal optical (LO) phonons at a frequency of 9 THz. Coupling such lattice motions to propagating sound waves holds potential for ultrasound imaging with a sub-nanometer spatial resolution. The fundamental principle of laser light can be adopted for phonons via the vibrational quantum in a crystal. Phonons can be absorbed or emitted by electrons in the crystal lattice. A net amplification of phonons requires that their number emitted per second via stimulated emission is larger than that absorbed per second. In other words, there must be more electrons emitting than absorbing a phonon. This condition is illustrated schematically in Fig. 1, in which the electron energy is plotted as a function of the electron momentum k, following roughly a parabolic dependence. For a thermal equilibrium distribution of electrons at room temperature [sketched by filled blue circles of different size in Fig. 1(a)], electron states at higher energies have a smaller population than those at lower energies, resulting in a net phonon absorption. Stimulated emission of a phonon can only prevail if a so-called population inversion exists between two electronic states separated by both the energy and the momentum of the corresponding phonon in the crystal [Fig. 1(b)]. For optical phonons, this condition is very difficult to fulfill because of their comparatively high energy. Researchers from the Max-Born-Institute in Berlin, Germany, the Sandia National Laboratories, Albuquerque, New Mexico, and the State University of New York at Buffalo, New York, have now demonstrated the amplification of optical phonons in a specially designed metal-semiconductor nanostructure [Fig. 1(c)]. The system consists of a metallic dog-bone antenna on top of a layered semiconductor structure consisting of GaAs and AlAs. This structure is irradiated with an ultrashort pulse at THz frequencies. On the one hand, the THz pulse excites longitudinal optical (LO) phonons; on the other hand, it drives an electron current in the thick GaAs layer. The LO phonons oscillating with a frequency of 9 THz (9 000 000 000 000 Hertz, about 450 million times the highest frequency humans can hear) are amplified by interaction with the electrons. 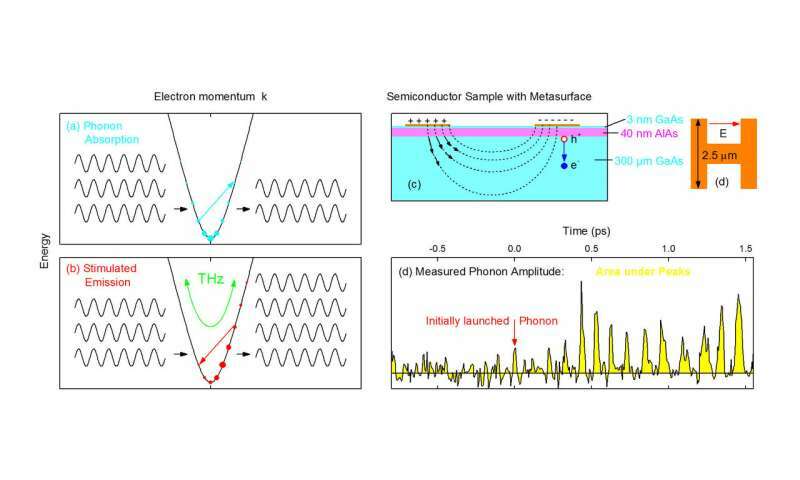 The strength or amplitude of the phonon oscillations is monitored via the concomitant change of the refractive index of the sample. The latter is measured with the help of a second ultrashort pulse at higher frequency. In Fig. 1(d), the time evolution of the phonon excitation is shown. During the peaks of the curve, there is a net phonon amplification with the yellow area under the peaks being a measure of the phonon oscillation amplitude. The movie attached shows the spatiotemporal evolution of the coherent phonon amplitude which displays both periods of phonon attenuation [situation Fig. 1(a)] and phonon amplification [situation Fig. 1(b)] depending on the phase of the THz pulse.